Suggested for grinding, sanding, sweeping and other non-oil based operations. Proprietary filter media. Suggested for grinding, sanding, sweeping and other non-oil based operations. Suited for heat, humidity or long periods of wear. Approved by the FDA for use in medical facilities. Low-profile design provides excellent field of vision. Effective against certain organic vapors and other gases. 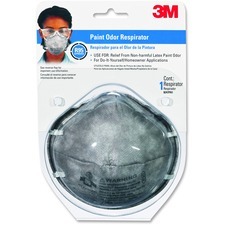 Industrial disposable safety respirators protect against non-oil and solid particulates. Designed for comfort, with a soft padded adjustable nose piece. Adjustable metal nose clips keep your eyewear free of fog. Elastic, double headbands provide a strong, secure fit.